This is a video of another superb bird : Long-tailed Broadbill.This video was taken by a birdwatcher in Kaeng Krachan National Park but I saw them many times in Khao Yai National Park.The first time I saw them in a mixed flock around 3 pm perched in a trunk,near the main road.The second time I found them on the nearby of the campground area in July 2007.In May 2008,I saw a couple of them nesting in a tree,close to the campground area.Their nests are unmistakable: a tear shaped nest with its entrance hole in the center of the nest.Most of broadbills make this kind of tear shaped nest. Hello to all my friends !!! Sorry for my delay but I was busy working in Thailand !! 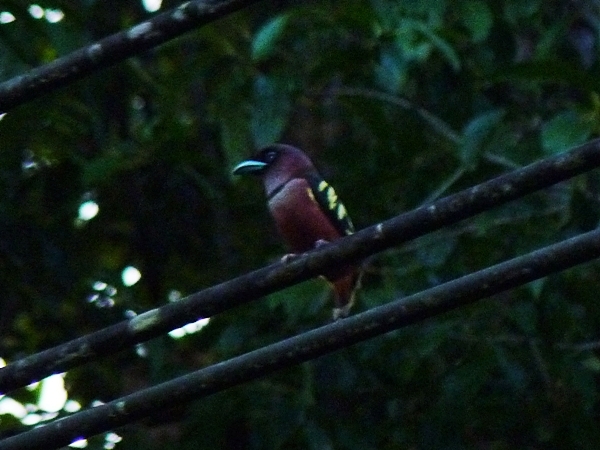 This is a stunning Banded Broadbill that i saw in Khao Yai National Park at 4pm,beside the main road !!! The photo is not very good because the weather was not good.However this is one of my favorite birds in South East Asia ! !